Please give me a couple of days only because I have to find it! ! sounds like a deal! Thanks!! 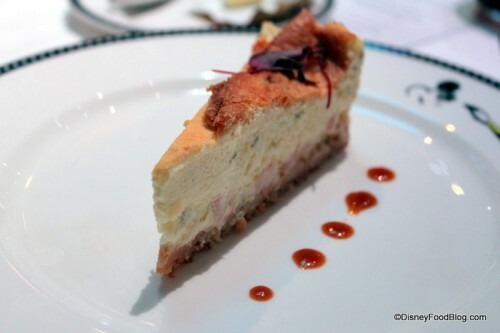 Here is a cruise ship cheese cake recipe. It doesn't say which ship. Oh wow look at this beauty. It's a banana Split Cheesecake one of the reviewers said they had something like it on a cruise ship. One final post because I love cruise ship desserts. This link is to a website with all kinds of different Cruise Ship recipes. Enjoy! And remember life is uncertain eat dessert first. I have to say that I remember that there was nothing extraordinary about Fran's cheesecake recipe. She NEVER put any topping on it although I presume one could. Kelly will learn that as soon as I locate Fran's cookbook which I know is here in the house because I ran across it. I shall say, that everyone whomever tasted it, told her it was by far, the best they'd ever had (even those folks from New York who have access to some of the world's finest cheesecake). I shall add that it felt as if it weighed a ton; I mean that sucker was heavy! Fran had promised she'd give the recipe to no one that such was one of her desires that when she died so did it would as well. Turns out she did, it didn't. Personally, while I like cheesecake (I admit especially Fran's) I am definitely not a cheesecake fanatic. There is a recipe in my family it came from my grandmother to my mom to me. It's called tahitian po'e and it quite a bit different then Hawaiian Poi even if the names are similar. I made it for my co-workers and they loved it. I didn't use the word Po'e or Poi so they were willing to try it. I will say there is Pumpkin and pineapple on in this dish. :-D I understand about Fran's secret recipe. But it sounds so yummy. If a cheesecake is done right it doesn't need the extra toppings. If you are willing to share the recipe I would love to have it also.